Abu Dhabi: The Zayed Sports City Stadium in Abu Dhabi had transformed into a ‘praying’ field from a playing field where new records are set and milestones are made with prestigious football events. As I entered this hub of sport activity on Tuesday morning, I did not see any cheering fans, but faithful immersed in silent prayers; I did not see the flutter of the team colours but instead a liturgy booklet; the Vatican flag and a white cap with a message of peace awaiting the 1,80,000 strong crowd on every single seat. 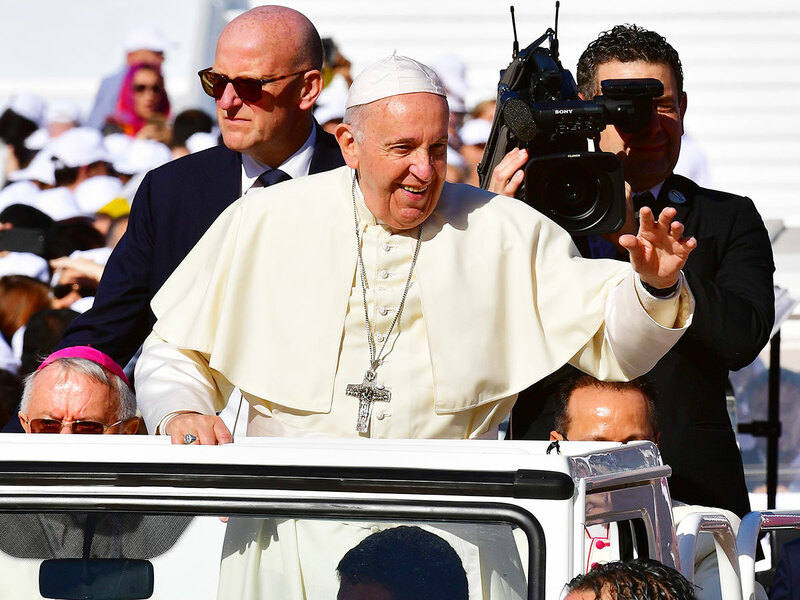 No score board but a documentary retracing the humble beginnings of Argentina-born Jorge Mario Bergoglio, who the world now knows as Pope Francis, the head of the Catholic Church, sovereign of the Vatican City State and His Holiness, regarded as the 'living saint' by Roman Catholics. Just as I was settling down in my seat, a not-so-old man sitting by my side pointed to a huge bird hovering above the stadium and remarked: ‘’That is the Holy Spirit descending upon us, my son." Like thousands of others, he was in his seat at pre-dawn. 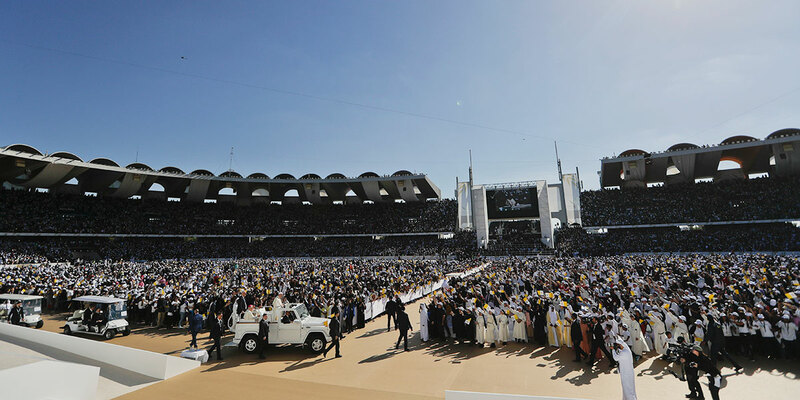 The atmosphere became more divine at the stroke of 7.30am with the recital of the Holy Rosary setting the mood for the first Papal Mass in the Arabian Peninsula. The UAE was on the cusp of making history and Zayed Stadium achieving another record of another kind. I never thought I would be a witness to this epic event. Barely half-an-hour after the rosary, the members of the multinational choir trouped in to rehearse the hymn Christ Be Our Light and the crowd went into raptures -- we saw the first wave of the yellow and white Vatican flags. The atmosphere was getting eclectic and the faithful spiritually charged. Then another hymn was rehearsed and the attendees went ecstatic again. Rounds of applause were also heard when His Highness Shaikh Mohammad Bin Rashid Al Maktoum, Vice-President and Prime Minister of the UAE and Ruler of Dubai, and His Highness Shaikh Mohammad Bin Zayed Al Nahyan, Abu Dhabi Crown Prince and Deputy Supreme Commander of the UAE Armed Forces, appeared on the giant screens as the highlights of the International Conference on Human Fraternity were replayed and Minister of Tolerance Shaikh Nahayan Mabarak Al Nahayan arrived at the venue.